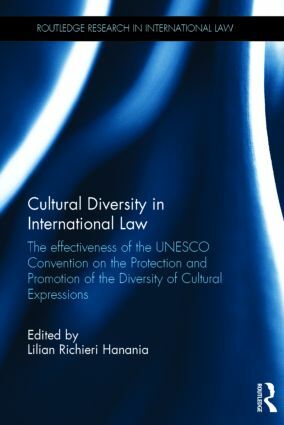 The UNESCO Convention on the Protection and Promotion of the Diversity of Cultural Expressions (CDCE) was adopted in 2005 and designed to allow States to protect and promote cultural policies. This book examines the effectiveness of the CDCE and offers ways by which its implementation may be improved to better attain its objectives. The book provides insight in how the normative character of the CDCE may be strengthened through implementation and increasingly recurrent practice based on its provisions. Hailing from various fields of　international law, political and social sciences, the book’s contributors work to promote discussions on the practical and legal influence of the CDCE,　and to identify opportunities and recommendations for a more effective application. Part One of the book assesses the effectiveness of the CDCE in influencing other areas of international law and the work conducted by other intergovernmental organizations through the recognition of the double nature (cultural and economic) of cultural goods and services. Part Two focuses on the practice of the CDCE beyond the recognition of the specificity of cultural goods and services in international law by addressing the CDCE’s call for greater international cooperation and stronger integration of cultural concerns in development strategies at the national and regional levels. The book will be of great use and interest to academics and practitioners in law,　social and political sciences, agents of governmental and international organizations, and cultural sector stakeholders.